tefanie Brückler, an Austrian based Graphic Designer, works with an infectious and cheerful enthusiasm and this book works as a love-proof for typography -even if her boyfriend is the absolute reason for it. Thing is, her motivation to design this love of a book has little to do with the world of typography or even design. It derives straight from the heart of a real world, where emotions and everything original comes from. Having travelled around for some period of time, gaining experiences and exploring new horizons Stefanie thought that there should be a way on capturing the moments and a way that she could personally express her thoughts, whilst practicing some of her typographic skills. She finally decided to design a book and offer it as a gift to her boyfriend, who also shared inspirational times while travelling. Since she is highly fascinated by the infinite variety of shapes and the curvy view of script/didone typefaces, she decided to capture her stories by generating them by hand. In this way she could smell the ink, she could follow the flow of brushes and pens and draw her own lines, she gave life to a project that seems to have endless possibilities. We have to admit it. Her dexterity in the field of lettering is spectacular. A lettering piece for every chapter of the trip works as an introduction while it expresses the vibrant and unique character of each visited area. Saying no to bright and shiny paper and choosing a subtle texture instead, Stefanie achieves a warm and cosy touch of the book which in combination with typography works appropriately as an expressive and elegant piece of art. The details add even more visual treatment and explained by her effort on cutting every lettering piece by hand instead of printing them out and assembling them to a book. Apart from the difficult part of merging together all the tiny pieces, her choosing a coptic binding to make the experience of holding the book and viewing the chapters even more unique had us drooling all over the place -in a sic and romantic way of course. So we have to be thankful to Stefanie and her attempt to express her love through typography. You can view more of her work here. 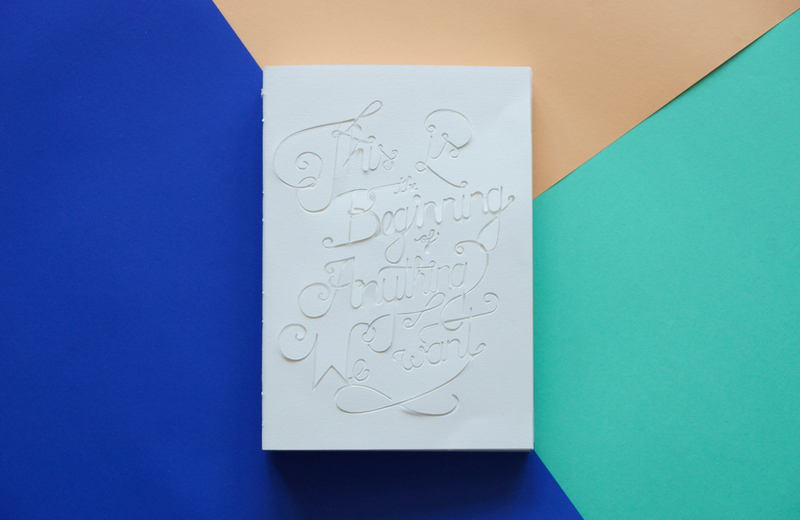 And now some even bigger news: SHARE YOUR TYPOGRAPHIC NOTEBOOKS WITH US. WE WANT YOUR LOVE SUBMITTED! If you own any notebooks with some exciting typographic references on them, share it with us, by providing also some spicy details on your motivation, secrets and inspiration. Let’s spread the love. But what is love apart from Hadaway’s amazing anthem? Well, the best drug is basically free as long as you abandon the futile solution to singledom.